Youtube is one of the largest video platforms and is most widely used by internet users. Billions of videos already uploaded by YouTube users. However, if you have a website based on AMP HTML, of course the code can not be accepted by AMP and make your AMP page error. Some default code changes are needed to become AMP-based code. You only need to take the Youtube video ID and copy it into the code provided by the AMP Project. By adding parameters to the IFrame URL, you can adjust the playback experience in your application. For example, you can automatically play videos using the autoplay parameter or cause the video to play repeatedly using the loop parameter. 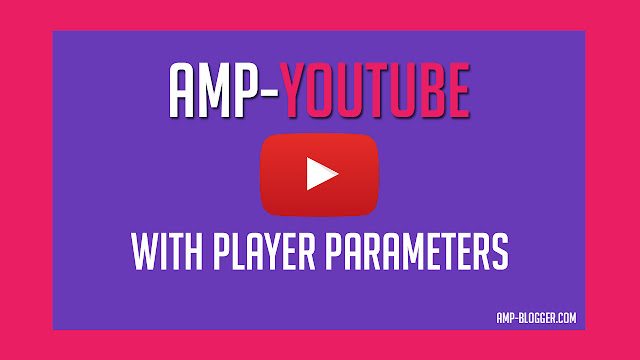 On the AMP page, there are some YouTube parameters that you can add to the embed code of AMP Youtube. The trick is to add code data-param-* (except autoplay) followed by parameter name. Ie, data-param-controls, which serves to remove the button control while the video is being played. I will explain some parameters that you can add to the AMP page, this code also supports the valid AMP Blogger Template. video sound automatically mute before autoplay starts. when the video is scrolled out of view, the video is paused. when the video is played to the display, the video continues playback. when the user taps the video, the video is voiced. Actually there are some youtube video parameters that you can apply, visit YouTube player parameter. For more details about amp-youtube, please visit this link. May be useful. If you have questions, please submit in the comments column of this article.